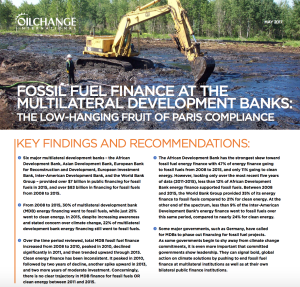 Yet a new analysis finds that six major multilateral development banks – the African Development Bank, Asian Development Bank, European Bank for Reconstruction and Development, European Investment Bank, Inter-American Development Bank, and World Bank Group – provided over $7 billion in public financing for fossil fuels in 2015, and over $83 billion in financing for fossil fuels from 2008 to 2015. From 2008 to 2015, 30% of multilateral development bank (MDB) energy financing went to fossil fuels, while just 25% went to clean energy. In 2015, despite increasing awareness and stated concern over climate change, 22% of multilateral development bank energy financing still went to fossil fuels. Concerningly, there is no clear trajectory in MDB finance for fossil fuels between 2011 and 2015. Recent analysis indicates that the potential carbon emissions from reserves of oil, gas, and coal in the world’s already-operating fields and mines would take us beyond 2°C of warming, making it more important that committed governments show leadership. MDB finance represents an extremely important slice of total global investment, and governments can signal bold, global action on climate solutions by pushing to end fossil fuel finance at multilateral institutions as well as at their own bilateral public finance institutions. Download the full database of energy finance used in the briefing here. Note: This work is licensed under a Creative Commons Attribution-NonCommercial 4.0 International License (CC BY-NC 4.0). If using the finance data, please attribute as being from Oil Change International’s Shift the Subsidies Database.